In this article, retail charter broker Gabriella Richardson (pictured) looks at a recent legal development affecting yacht charters in Greece. Generally offering greater value for money in terms of both overall charter rates and running costs, the Greek archipelagos of the Ionian and Aegean seas have in the past been a popular yachting destination among those looking for a slightly less ostentatious and more relaxed charter experience. However, as the post-Christmas booking season gets into full swing, Greece has just passed a new law that will radically limit the number of charter yachts able to embark and disembark guests in its waters for the summer 2018 season. In most European destinations, commercial yachts are able to charter as long as they pay VAT to the government within whose waters they are cruising. Greece, however, requires charter yachts to be in possession of a Greek charter licence when entering its waters with guests on board. Acquiring such a charter licence can be a lengthy and arduous task, with the company that owns the vessel first needing to establish a branch office with a legal director and VAT number in Greece. Additionally, only yachts registered under an EU flag and port of registry can obtain a Greek charter licence, which essentially shuts off non-EU flagged yachts from chartering in Greek waters. Until last month, non-EU flagged vessels without a Greek charter licence were permitted one-way embarkation or disembarkation by the authorities, and a charter could start in the capital, Athens, providing it ended elsewhere. However, under the new law, non-EU flagged yachts must now both embark and disembark their guests in a foreign port, or face prosecution and hefty fines. 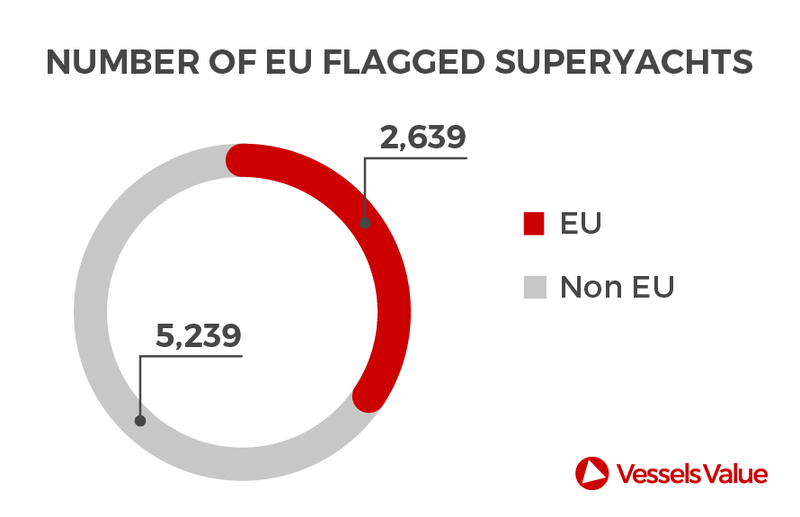 With many owners choosing to flag their yachts offshore under non-EU registries, Greece will become an increasingly unattractive option for the summer season. 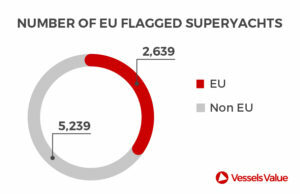 The chart below shows the breakdown of EU and non-EU flagged yachts worldwide. Yachts relocating to Greece for the summer season have in the past based themselves in the internationally-connected city of Athens, where there are developed re-provisioning services and several marinas offering competitive rates for overnight stays. 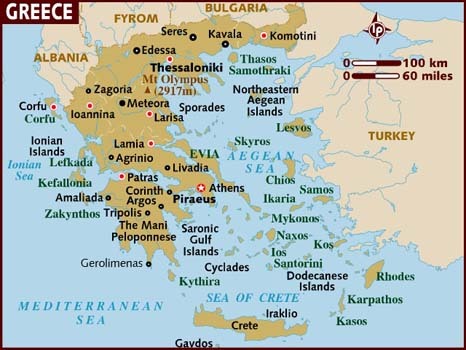 Unable to acquire a charter licence, those yachts intending to cruise Greek waters will now have to start and end in either Turkey or Albania, the two foreign ports closest to Greek waters. This is a burdensome deviation from the standard Athens-Athens Greek charter itinerary, and one which will inevitably deter non-EU flagged vessels from relocating to Greece to charter in the area. Finally, as an extension of the law, non-EU flagged charter yachts in Greek waters without a charter licence cannot disembark guests during the charter to allow different guests to embark and take their place. Once guests board the charter in either Turkey or Albania, those exact same guests must eventually disembark and there can be no deviations. This poses a problem where principal charterers look to spend several weeks on board, with different guests invited to come and go intermittently. Given the turbulent nature of the Greek economy in recent years, this is a surprising move and one that will ultimately curtail the amount of revenue that the Greek government derives from the lucrative yachting industry. Relevant organisations, including the Greek Yachting Association, are currently in talks with the government in an attempt to lobby the decision-makers into changing this new legislation. Unless the law is revised, owners of non-EU flagged yachts, who also actively charter their vessels to recuperate running costs, will inevitably choose to acquire charter bookings elsewhere. Gabriella Richardson is a retail charter broker at Camper & Nicholsons. She can be contacted at grichardson@camperandnicholsons.com and on +44 7554 431471.